Introduction: There is a growing body of work that suggests warmup can positively impact a performers physical and cognitive agility, enable better focus and lead to lesser errors. and cognitive skills is an accepted practice in many domains such as sports or music. While the level of involvement of psychomotor and cognitive skills in surgery is very high and comparable to domains such as sports, there is a lack of warmup activities in surgery. 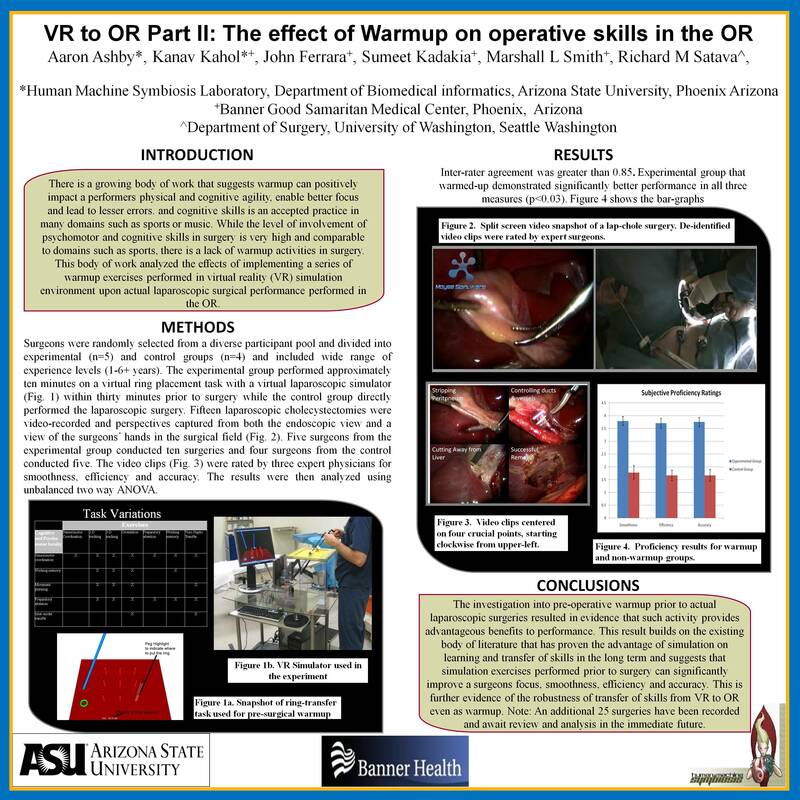 This body of work analyzed the effects of implementing a series of warmup exercises performed in virtual reality (VR) simulation environment upon actual laparoscopic surgical performance performed in the OR. Methods: Surgeons were randomly selected from a diverse participant pool and divided into experimental (n=5) and control groups (n=4) and included attending surgeons. The experimental group performed approximately ten minutes on a virtual ring placement task with a virtual laparoscopic simulator (see Figure 1) within thirty minutes prior to surgery while the control group directly performed the laparoscopic surgery. Fifteen laparoscopic cholecystectomies were video-recorded and perspectives captured from both the endoscopic view and a view of the surgeons’ hands in the surgical field. Five surgeons from the experimental group conducted ten surgeries and four surgeons from the control conducted five. The video was rated by three expert physicians for smoothness, efficiency and accuracy. The results were then analyzed using unbalanced two way ANOVA. Figure 1. VR Simulator used in the experiment Figure 2. Results of the experiment.